O-Powers are a returning feature that work the same as before. 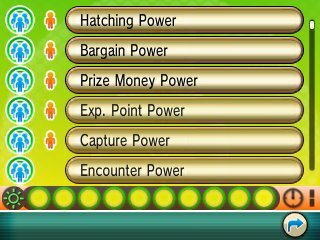 Several O-Powers will allow for you to increase stats within battle, while others will help you gain more experience or make your captures more likely. Like in Pokémon Black & White, you have the ability to share your O-Powers with your friends, but this can now be done over the internet so you can request help from your friends any time they are online. You can't send Encounter or Stealth Powers to people. Obtaining the O-Powers is somewhat of a mini quest in itself. 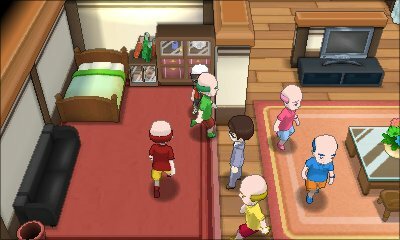 When in Mauville City, if you go to the Pokémon Center, you will find a strange man, Giddy, next to the map in the top right hand corner. Talk to him and he will give you an O Power, and then another. He'll then leave and be replaced by Hipster. He will give you three different O-Powers before he then leaves. After that, Bard appears and will ask you to listen to songs, and give you two O-Powers. A new man, Trader, then appears and offers to trade you Secret Base Decorations for a variety of simple items such as Potions and Poké Balls. In doing so, he too will give you an O-Power. Finally, after he goes, another man, Storyteller, appears and tells you stories about yourself and gives you an O-Power. Speak to him again after beating the Elite Four and he will invite you up to his apartment in Mauville Hills. When there, they will tell you that they are longing for someone to give power to, and learn of a powerless man across the hall. Speak to him and he will go to their apartment. Soon, the five men explain that they want to retire and they soon start to merge with the man and the man becomes Mr. Bonding. Just before he leaves for other regions to give O-Powers, he gives you the final O-Power.